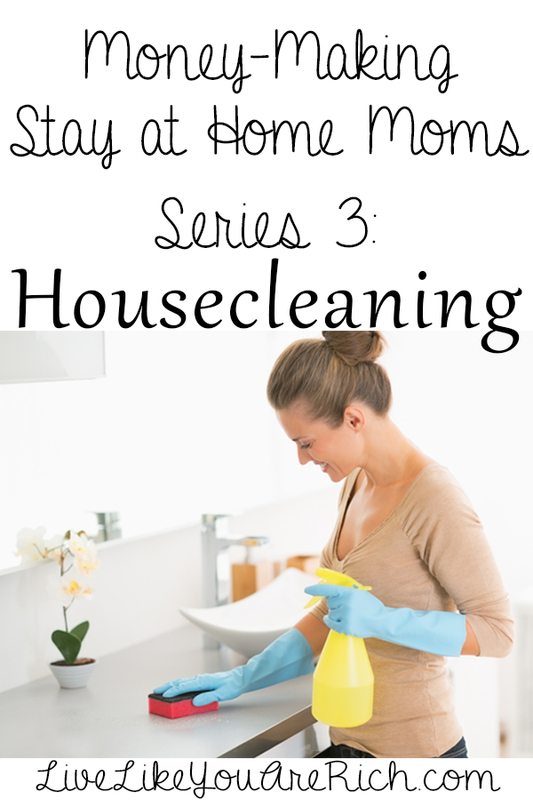 Welcome to Money-Making Stay at Home Moms: How to Make Money by Housecleaning. There are 38+ interviews in this series (see links below interview). I realize that the phrase Stay at Home Mom ‘illustrates’ a mom who is at home most of the time. Yet, most women and many men know that SAHM’s are usually on the go and away from the home throughout the day. They typically have a schedule filled with dropping kids off, picking them up, grocery shopping, running errands, etc. So when I approached my friend to contribute to this series I understood that she is a SAHM even though she is on the go most of the day too. Q. Would you like to remain anonymous or not? A. I would like to remain anonymous. A. I was divorced. My husband left us a few years ago right before Christmas. I didn’t have a job or any source of income and I had a mortgage to pay and kids to feed. My ex and I had four kids. When he left he didn’t leave us with any money at all. I am from a distant country so I didn’t have relatives to move in with or really any family that could help us out. I had to make as much money as I could in as little time as possible. I had a cleaning business when we first got married so I just fell back into that. It’s flexible and my daughter was 2 years old, my next oldest was in Kindergarten. So they could come with me and I didn’t have to put them in daycare. Soon housecleaning became a full time business. A. I spoke to a few people at church, friends, and family. Many were interested in hiring me. After they saw that I was good at my job, they would refer me to their friends. In turn, their friends would refer me to others and so on. I also marketed myself through Facebook (just by posting on my personal page). I worked fast and was thorough so I continued finding more and more work through referrals. I now have more clients than I can almost handle. Q.What are some tips you would like to share with others who are interested in doing something similar? A. If you are going to start cleaning houses on your own, I recommend you learn about taxes and the business side of things at the start. I was too busy trying to figure out how to feed my kids that I didn’t take the time to set up a proper business structure. I’ve had to go back now and figure it all out. I wished I had been tracking everything from the very beginning! A. I work about 25-30 hours a week. It stays pretty consistent. But the problem with housecleaning is that some people may not treat you like an actual business and cancel last minute or need you immediately. I recommend starting off very professionally and set up an agreement (about cancellations and bookings) with each client. It is hard financially when people cancel (as I’m sure it would be with most small businesses) because I don’t get the work or get paid. But it is worth it for the flexibility, the fact that I can bring my daughter and kids with, and so that I can be home with my kids when they get home from school. A. While the kids are at school is when I typically do the majority of the work. I also work when their dad has them. It was mainly friends and family whom I started working for at the beginning so my kids would play in their backyard or with their kids and they were fine with it. I make sure to ask new clients before agreeing to work with them if my child and sometimes children are welcome to come. My daughter just watches TV while I work or plays quietly with a puzzle or toy. On days when the kids are all out of school I have them play together in my clients backyards while I clean. The older ones watch over the younger. So far it really has worked out great and my clients generally don’t mind. You have to really enjoy cleaning in the first place. Don’t become a house cleaner if you don’t love cleaning! Ask your clients to provide their own cleaning supplies because each person likes their own thing and this will save you a lot of money. Try to keep your work local so you aren’t paying a ton in gas driving around. Expect friends and family to not treat you professionally so set your boundaries from the start. Really try to establish professional expectations from all clients from the start. Don’t clean family and friends houses for free, its not a good precedent to set. You can give them a discount but never do it for free. You can’t fake it. You have to work hard and be honest, thorough, consistent, and reliable. Your clients will know whether you worked hard or not, so always do your best. Write expenses and income down regularly. Keep receipts. Try to find out what each client likes and doesn’t like. Write the important things and details they tell you down. Make a note of their favorite cleaning products or ways they like things cleaned. Check with them every once in awhile and make sure you know that you are cleaning the things they want cleaned (in the way they want) and getting the things done that they want done. A. No it wasn’t. I know how to clean but there are always tips and tricks to learn. You can find most of those on the internet and through experience and practice. Q. Does the income help a little, a moderate amount, or is the main source of your family’s income? A. I charge $20-$30 an hour. So housecleaning is the majority of our income. It pays the rent, keeps food on the table, etc. At first I didn’t receive child support so we were totally reliant on the income from housecleaning. Lately, my ex has started paying child support which helps a little and I appreciate it, but house cleaning is still the main source of my family’s income. A special thanks to my friend who is an excellent mother and house cleaner. If you have any other questions for her please comment below. My mom used to clean houses and it was a blessing to our family and the families she cleaned for – I helped her some when I was a teen and it was good experience. Blessings to the author – it sounds like she’s doing an amazing job! I love that she included you in the cleaning! What an awesome way to teach a child to work and help the family out. Thanks! Thanks for your comment and I really appreciate the info and the compassion! She is now in a much better situation and her husband is paying her monthly. I didn’t ask her if she did or did not ask the government for assistance (it was a bit too personal) but things have really smoothed out for her and her exhusband has been taking more responsibility. Good for you for working so hard! I am a stay at home mother and would love to work if I can find house cleaning job. Your story inspired me. Thanks for commenting! I wish you the best!